2018 marks 100 years since the formation of the Royal Air Force, undeniably one of the most important anniversaries to be celebrated in British military history. Already one glorious century lies behind the RAF protecting the skies above The British Island. These hundred years are overflowing with narrations of great audacity, virtue and self-sacrifice by the courageous men and women who served and still serve in the flying force of the British Army. 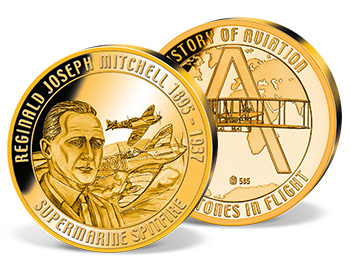 Minted to mark the 80th anniversary of the first flight of this truly remarkable aeroplane, we are delighted to present this commemorative strike, exclusively available to Windsor Mint customers. The first in the 'British Military Aircraft' collection, it is a lasting reminder to the legendary fighter. Masterfully engraved with colour and plated in pure gold, it is minted to the highest quality 'PROOF'. Strictly limited to only 9,999 complete collections worldwide it is a unique reminder of a defining moment in modern history. This iconic fighter plane – elegant (graceful), skillful, rapid and deadly – played a crucial role in what was named after Winston Churchill Britain’s “finest hour”. The Supermarine Spitfire served in the aerial defence fightings over British ground that were called “The battle of Britain”. And it fully deserves its reputation as a true “hero of the sky” – possessing an outstanding position in the fleet that saved Britain from a dead certain invasion. No other plane captures the British fighting spirit and represents the Flying Force as well as this marvel of aeronautical engineering. The plane was a single-seat armed interceptor, primarily deployed during World War II to protect British bombers and attack German bomber squadrons. Its strengths mainly consisted of its enormous speed (top speed at 355 mph), altitude (up to 34.000 feet), fabulous manoeuvrability and sheer power due to its Rolls-Royce Merlin engine. Entering the service in 1938, the brainchild of Supermarine's chief designer Reginald Joseph Mitchell probably became the most iconic aircraft in the Royal Air Force's aviation history and fast achieved legendary status. 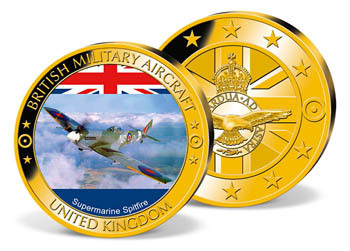 That’s why we are delighted to be able to offer you a sought-after commemorative strike - available exclusively to the customers of Windsor Mint - honouring this notorious “Pride of the Skies” forever ingrained in the memory of the British people. 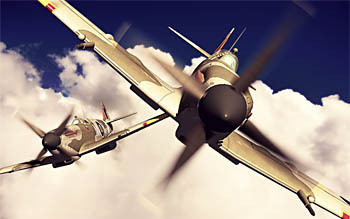 The Battle of Britain was an intense air clash fought mainly throughout the summer of 1940 in the skies over the United Kingdom between Germany and Britain. It was the first major campaign to be fought entirely by air forces. The name of the conflict was derived from a speech Prime Minister Winston Churchill held at the House of Commons in which he announced “The Battle of France is over. I expect the Battle of Britain is about to begin”. From July 1940 on shipping centres such as Portsmouth were the first targets, a month later the German Luftwaffe attacked RAF Airfields and infrastructure and also launched heavy attacks on factories and areas of political significance, known as “The Blitz”. This aerial fight soon became as what is known today – both sides were locked in the largest and most sustained bombing campaign on British Ground to that date. Ultimately it was a decisive victory for the RAF and Britain, because the Germans underestimated the British spirit by far. After heavy losses of their aircrafts Germany failed to destroy Britain‘s air defence or to force Britain into an armistice. It was the first time Germany had faced defeat in World War Two – truly a turning point for further warfare. Two days later Hitler cancelled “Operation Sealion” and indefinitely had to postpone the strategically war-decisive invasion of Britain. 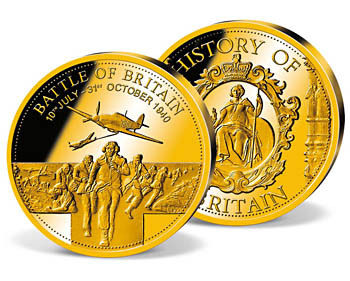 The so-called “Battle of Britain” – in which British and German air forces clashed in an intense battle in the skies over southern Great Britain – resulted ultimately in what was a decisive victory for the RAF and Britain. Crucially it was the first time Germany had faced defeat in World War Two – a true turning point in the course of further warfare. The so-called “Spitfire Summer” culminated on Sunday 15th September 1940, when the German Luftwaffe undertook a massive assault, which they thought would shatter British resistance and open the path for a successful invasion of Britain. Approximately over 1.000 German aircraft armed with a huge bombing arsenal carried out the attack that day with their prime target London. But the British command was well prepared, so that RAF fighter planes and anti-aircraft guns could deliver a smashing blow to the German air offensive. At the height of the battle Churchill asked Air Vice-Chief Marshal Keith Park “How many reserves do we have?”… “There are none” came Park’s reply - every British plane was in the sky. It was a day of heavy fighting that ended in victory for the RAF. Two days later Hitler cancelled “Operation Sealion” and delayed the German invasion indefinitely. The famous “Battle of Britain” was an intense air battle in which British and German air forces clashed in the skies over the United Kingdom during the summer and autumn of 1940, after the fall of France. Even more than 75 years later, historians and the people agree that this was one of the most defining moments of recent British history. Following months of fighting in the skies from July through September 1940 over southern England in what became known as the “Spitfire summer”, the RAF successfully defended the United Kingdom against tirelessly and destructive air raids conducted by the “Luftwaffe”. The situation was crucial, because a victory for the Luftwaffe would have exposed the British island to an invasion by Hitler’s armies, which were already in control of the ports of northern France. Fortunately the battle was won by the Royal Air Force (RAF) Command under heroic efforts. This victory not only prevented the possibility of an invasion – Hitler in fact cancelled “Operation Sealion” shortly after - but also created the conditions for Great Britain’s survival and shaped the way for the defeat of Nazi Germany. 70 years ago on 18th June 1940 after the evacuation of Dunkirk the newly elected Winston Churchill gave his famous speech “The Battle of France is over. I expect that the Battle of Britain is about to begin”. History proved him right, because soon after, the fighting, which went down in history as one of the biggest air battles of all times, commenced. 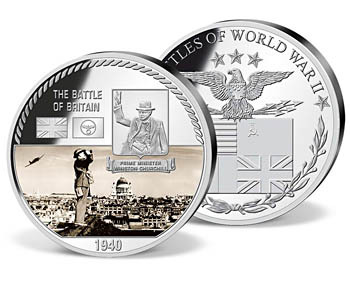 This silver plated commemorative features a sepia-tone image of London during the Blitz and a portrait of Winston Churchill. Don't miss this opportunity to add this finest hour to your collection. 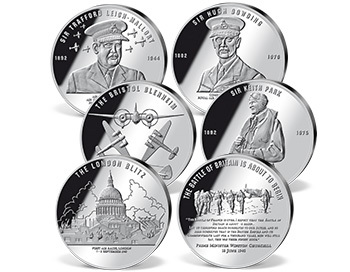 This commemorative is plated in .999 pure silver and minted in highest quality 'proof'. 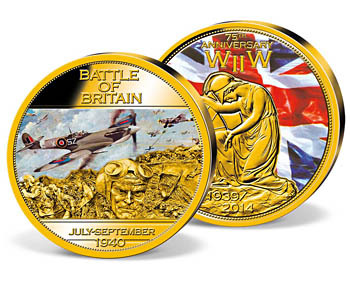 It features a sepia-tone image of London during the Blitz and a portrait of Winston Churchill and is available exclusively from Windsor Mint. As a fitting tribute there are numerous official events, ceremonies and other activities taking place all over the UK this year to celebrate this occasion. Amongst others a service at Westminster Abbey and a huge military parade along The Mall to Buckingham Palace. On 1 April 1918, the RAF was officially formed as a separate military service as the Royal Flying Corps and the Royal naval Air Service merged. This new unit even came up with its own ministry under a secretary of state for air. But there has been already a prehistory of bringing into being the new army division years before Britain entered the First World War. In April 1911, only eight years after the American brothers Wright pioneered the first powered flight in history, the first air units in Great Britain’s army were formed. At this time an air battalion consisted of one balloon and one airplane company. Already in December 1911 the British Admiralty built the first naval flying school – the Royal Naval Flying School - and the following years both were assimilated into the newly created Royal Flying Corps, thus formed with naval and military wings. In July 1914 the specialized aviation requirements of the navy and the imminent war finally led to the creation of the RNAS (Royal Naval Air Service). Soon after, in late summer 1914, things overturned while Britain declared war on Germany and entered the stage of World War I by sending four squadrons to France. During the first two years of the war scenario, Germany took on the strategic leadership in the air with superior technologies like the zeppelin airship and the manual machine gun. England’s towns and cities were exposed to damaging bombing raids and the pilots of the RAF had to suffer frustrating defeats in the skies by German flying aces such as the famous “Red Baron” Manfred von Richthofen. The ongoing German assaults forced British military strategists to exercise pressure for the creation of a separate air ministry, which would be able to execute strategic bombing against Germany. This finally led exactly on April 1, 1918, to the formation of the RAF, as a merge of the Royal Flying Corps and the Royal Naval Air Service along with the Women’s Royal Air Force (WRAF). Things developed fast and one of the results of these efforts was that by the war’s end in November 1918, the British Military aviation had gained clear air superiority along the Western Front (i.e. the German and French border) and made a big contribution to the Allied victory over Germany and the other Central Powers. As another result of these impressive and absolutely effective efforts the RAF had become the largest air force in the world at this time, with some 300.000 officers and airmen and more than 22.000 aircraft. It was also the first time that any country had created a completely independent air force. Soon after the war, the British flying force was greatly reduced in size and during the inter-war years played a vital role as what was seen as to "patronize" the British Empire across the globe. But the biggest challenge was yet to come. 1940 was probably the most crucial and dangerous moment in the history of the RAF – luckily unequalled in history so far. In Summer 1940, the states of continental Europe fell to Hitler’s armies one by one, leaving Britain alone in its resistance to the furious aggressor. Hitler’s Germany also planned an invasion of Great Britain and therefore started to bomb British ports and cities large-scale. The rousing motto of the Royal Air Force “Per Ardua Ad Astra”, which means “Through Adversity to the Stars” well captures the bravery that the members of the Royal Air Force had to raise in front of an aggressive and armed to the teeth enemy like Germany in the aerial defence fightings over British ground that were called “The battle of Britain”. At the beginning of WWII the German air force featured substantial numerical superiority to the British Flying Corpse. Its 4.000 planes clearly outnumbered the 2.000 RAF fliers. To make matters worse, the British air fleet included lots of old and not very furious machines like the Hawker Furies and Gloster Gladiators, whereas the German “Luftwaffe”, i.e. the German flying force, had been thoroughly re-equipped with modern combat aircrafts after Hitler's take-over of power. The RAF fighter pilots, however, proved themselves in the opening stages of the war during the “Battle of Britain” putting up a fierce resistance against the massive German air invasion. Over the summer of 1940, the British Flying Forces held off the Luftwaffe in probably the longest lasting and complicated air campaign in world’s history. Things changed dramatically with the notorious spitfire entering service in 1938. This swift and deadly aircraft played a key part in Britain’s “finest hour” as to Prime Minister Churchill, while it served not only in the “Battle of Britain”, but also in every major theatre of the Second World War. Also known as the “Spit”, the brainchild of Supermarine’s chief designer Reginald Joseph Mitchell, became the most produced British combat aircraft before or since the Second World War. Slightly more than 20.000 Spitfires were built in different variations over 12 years and finally helped to defend Britain and to defeat the aggressor. This fact obviously contributed immensely to the delay and cancellation of the German invasion-plans (Operation Sea Lion) and in May 1941 the “Battle of Britain” came to an end. Prime Minister Winston Churchill’s review of the War in the House of Commons on 20 August sounded like this: "Never in the field of human conflict was so much owed by so many to so few". 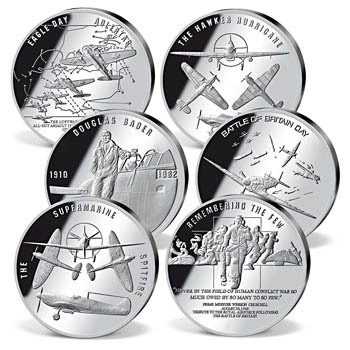 Pilots who fought in the battle were awarded the honour to have been called “The Few” ever since. Like the probably most famous fighter ace of British history Douglas Bader, who joined the RAF as an officer cadet and lost both legs in a flying accident. Nevertheless he rejoined the service when World War II broke out and took to the skies courageously to defend Britain despite disability destroying remarkably 22 enemy aircraft. Bader became deservedly one of the symbol figures of the RAF. By the time the war ended, the strength of the RAF was about one million personnel. Later, the wartime forces were demobilized to a total strength of about 150.000, the approximate number still retained in the 1980s. For all its downsizing, the RAF remained an effective instrument for protecting British interest and influence all over the world. Since the end of WWII, the British Flying corpse has been part of many campaigns - i.e. the Berlin Airlift of 1948/49 with 147 planes flying more than 63.000 sorties to support the people of West-Berlin, which suffered a blockade under soviet control; the Suez operation in 1956 when Egyptian airfields were bombed to keep free the suez canal; the Falklands War of 1982, a ten-week battle between Argentina and the United Kingdom over two British dependent territories, where air cover was largely supplied by ship-borne Harriers with their ability to vertical and short takeoff and landing and many more. To this day, the Military aviation of the British Army is charged with the air defence of the United Kingdom and the fulfillment of international defence commitments. And to this day it is still one of the most powerful air defence forces across the globe. 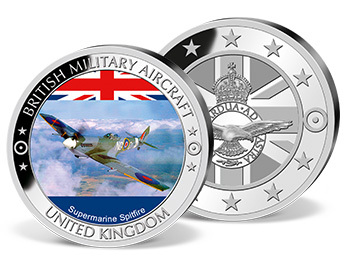 Reason enough to celebrate this occasion of 100 years exist of the RAF on a large scale and joining their centenary celebrations with our coins and commemorative strikes.